This recipe is adapted from Nancy Silverton’s Pastries from the La Brea Bakery. Her recipe is spot on for flavor profile. I tried a few other recipes out there that called for cinnamon or a range of other spices in the dough, but her formula hit the mark right on. I changed the flour to three parts all-purpose and two parts whole wheat, which makes them even healthier. And since they don’t have any preservatives added they are just plain better for you than the store bought versions. I recently found a supplier of freshly ground whole wheat, which I wrote about in my country wheat hearth bread recipe and it makes such a difference in flavor. I highly recommend sourcing some out in your own area if you can. I absolutely love it when things come out pretty, but usually I am in a hurry or the baby is crying in the background and prettiness takes a backseat. You can take the time to make these crackers really pretty by grabbing out the ruler and measuring them out into nice 2 1/2 ” x 4 1/2″ rectangles. The first time I made these I did try to make them in the traditional form, but then I took a cue from reading a post on the smitten kitchen food blog, and cut mine with a pastry wheel into little 1″ squares. I thought they would be a nice size for my son’s little hands. Preheat your oven to 350 degrees with one rack positioned near the top and the other near the bottom. These can be made in a food processor fitted with the steel blade or the bowl of a stand mixer with the paddle attachment. Combine the flours, dark brown sugar, baking soda, and salt into your work bowl. Add the butter pieces and pulse or combine until it resembles coarse meal. In a small bowl combine the honey, milk, and vanilla together until they are well mixed. Add this to the flour mixture and mix until the dough just comes together. It will be very sticky and soft. Wrap the dough in plastic wrap and place in the refrigerator for at least 2 hours or overnight. Remove the dough from the refrigerator and divide in half. Return the second half to the fridge while you work with the first half. On a well-floured counter roll your dough out to an 1/8″ thickness. The thinner you roll the dough the crispier the crackers will be. Then you can cut out your dough into the desired shapes (traditional graham crackers or any other shape that strikes your fancy). 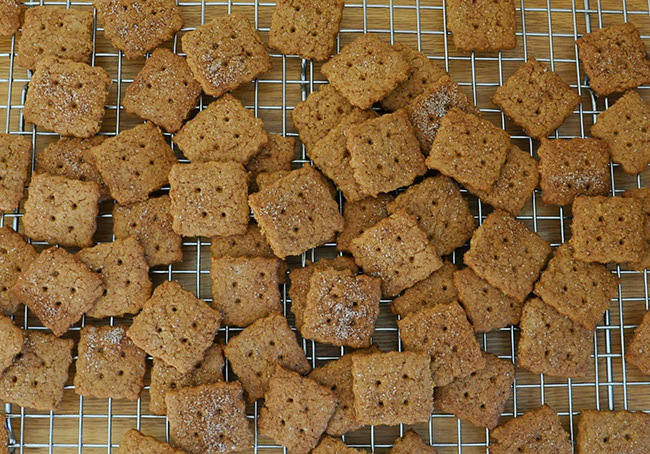 For traditional graham crackers you will want to divide your dough into 2 1/2″ x 4 1/2″ rectangles then lightly score each rectangle with a line halfway down horizontally and vertically. This will make the traditional quartered design. Then you need to dock the crackers with either the tines of a fork, a pastry docker, or the blunt edge of a wooden skewer. Place on a lined (parchment or silpat) baking tray and bake for 15-20 minutes, rotating the trays half-way through baking. They will be a dark brown color and smell lightly toasted when done. They will be soft when they are hot, but will crisp up as they cool. Once they are completely cool it is important to place them in a airtight container, otherwise they will go from crisp back to soft.